Your Walking Foot sewing machine is a masterpiece of industrial engineering upon which you safely rely day in and day out in all your endeavors for making homemade clothes and other stitching creations. It may even be that you run a business out of your home using your Walking Foot and cannot afford to have it malfunctioning or broken down. In many cases, you may be able to solve your own problem at home, given a Walking Foot product manual and quick access to the exact spare parts and accessories that match your machine. Other times, hiring professional sewing machine repair specialists may be necessary. Your needle keeps breaking or bending: There are many possible causes for a sewing machine needle to break. It could be you are using the wrong needle for your machine or for the task being performed. It could also be a too-tight threading job or a matter of hitting pins as you sew. However, it could also be the tension is off because thread particles inside your machine are fooling the sensors into thinking you are using a thicker thread. Dust, bugs, and who knows what else may also be trapped inside, and a professional sewing machine “tune up” may be in order. The upper thread frequently breaks or jams: First verify your thread size, needle size, and fabric thickness are a good “team” and that you have threaded the machine according to manufacturer’s instructions. However, it could be you need to order a new spool cap that better fits the spool size. The proper size will leave some “elbow room” around the spool cap and the spool pin tip so the thread can move smoothly out. If you still have a problem, also order a piece of spool cap felt to help the cap turn with ease, or it could be the same problem as #1 above (your machine needs a professional cleaning). 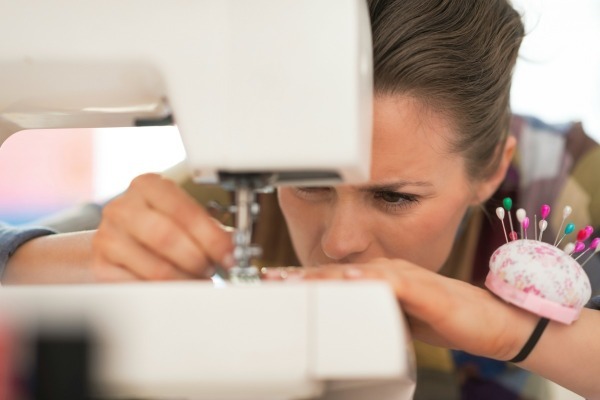 Oil gets on the fabric and oily gunk is on the machine: You need to periodically oil your industrial Walking Foot sewing machine but only with special sewing-machine specific oil that will safely lubricate moving parts and prevent internal corrosion. Too much oil, however, calls for a thorough internal cleaning, and if you haven’t been re-oiling with the proper type of oil every few major projects, open up the machine to check for rust and worn parts. The engine is making irregular noises: If, instead of a pleasant “purr,” you hear banging, jolting, and grinding, internal parts may be jammed or broken, though it could be excessive lint build-up as well. Never use a machine in this condition until the problem is identified and solved. Some screws are loose or missing: Most loose screws should simply be tightened, but never tighten a hex screw since that could affect your machine’s timing/settings. If screws are missing, order replacement screws that exactly fit. If a hex screw is missing, both re-ordering and professional servicing may be necessary. Keeping your sewing machine in optimal working order will prove well worth the effort and investment. It will maximize productivity, minimize stress levels, and prevent an easy fix from developing into something worse. To make your industrial walking Foot sewing machine run more efficiently and last longer, it is important to catch the early warning signs and take corrective action quickly. You may also need a specialist parts supplier, like Sewing Machines Australia, that carries a wide range of industrial sewing machine replacement parts and accessories, besides offering technical assistance.